Aaand… CUT! Charlie Zielinski has a taste for making great films. He knows all the right camera angles, the perfect lighting, and the brightest vision on how a video should turn out to be. With a dream to be a film director, Charlie knows how to tell stories with a video camera, a mic, and an editing program. LOL! With a great sense of humor and quirky sarcasm, it’s no surprise that Charlie Zielinski has a likeable personality. In fact, he’s pretty sarcastic 95% of the time with his friends, which is why they are always laughing when he’s around. Ever feeling down? Just befriend Charlie and let the natural comedian do his thing. “Stuff” That’s what Charlie Zielinski said about what he can offer the newsroom. 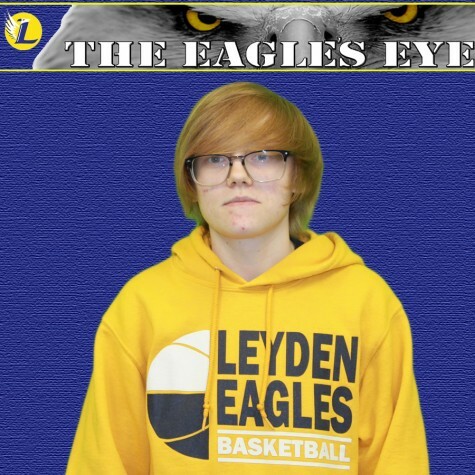 “Opinion stuff, entertainment stuff, and stuff that happens outside of Leyden.” Don’t let the general comment fool you, Zielinski has a lot to offer. As a very well up to date person, Zielinski can provide the newsroom hot topics that’s causing controversy in America or the world, or maybe the more lighthearted stuff such as upcoming concerts in the area. Not only that, but he’s pretty savvy with the camera. Video announcements are about to get a big upgrade this year folks, now that the camera’s in the right hands.